Bone marrow necrosis in a female B6C3F1 mouse from a chronic study (low magnification). 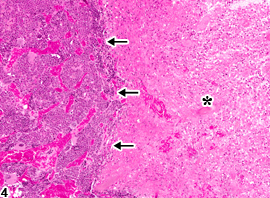 Bone marrow in a female B6C3F1 mouse from a chronic study (higher magnification of Figure 1) showing bone marrow necrosis characterized by remnants of hematopoietic cells with indistinct borders, nuclear pyknosis, karyolysis, and karyorrhexis. 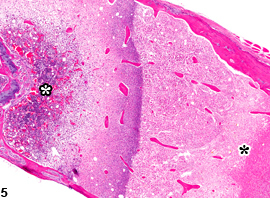 Bone marrow in male B6C3F1 mouse from a chronic study (low magnification), showing a large well-demarcated eosinophilic area representing necrosis (asterisk). Arrows represent the line of demarcation between viable cells and the area of necrosis. Bone marrow in a male B6C3F1 mouse from a chronic study (higher magnification of Figure 3), showing the area of necrosis (asterisk) and the line of demarcation (arrows) between the viable cells and the area of necrosis. 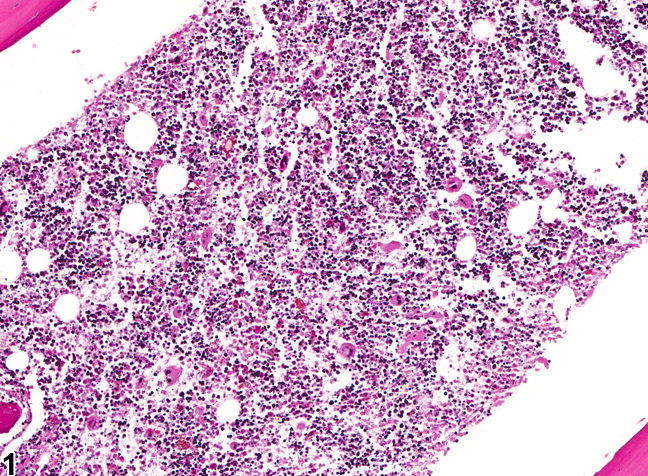 Bone marrow in a male B6C3F1 mouse from a chronic study (low magnification), showing normal hematopoietic cells (white asterisk) transitioning to a large area of necrosis characterized by loss of cellular detail and areas of amorphous eosinophilic debris (black asterisk). 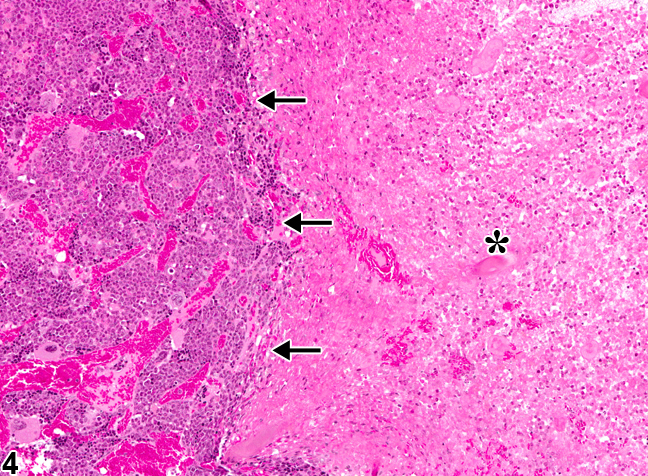 Bone marrow necrosis is characterized by cytoplasmic vacuolization, indistinct cell borders, nuclear pyknosis, karyolysis, and karyorrhexis ( Figure 1 and Figure 2 ). It is important to distinguish these changes from postmortem autolysis, which can have a similar appearance. With time, affected hematopoietic tissue is replaced with amorphous granular eosinophilic debris ( Figure 3 , Figure 4 , and Figure 5 ) that should not be confused with fibrin deposition. 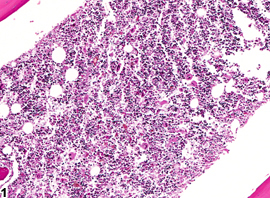 In the acute stage, necrosis may be accompanied by acute inflammation or hemorrhage, while later stages or cases of subacute necrosis may be associated with increased numbers of macrophages in and around the necrotic area. Lesion distribution may be focal, multifocal, or diffuse and, in the case of ischemia, may be determined by the affected marrow blood supply. 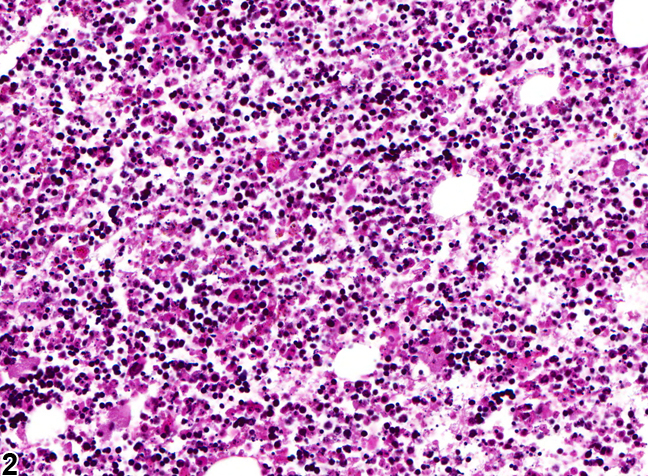 With time, necrotic marrow may eventually repopulate with hematopoietic cells, and in some cases, areas of previous necrosis may be replaced by fibrosis. There are several known causes of bone marrow necrosis. It may occur as a direct result of compound administration (e.g.,cyclophosphamide) or may be secondary to severe infectious disease states (e.g., septicemia) or tissue ischemia caused by vascular injury, thrombosis, or vascular occlusion. Specific causes of the latter include neoplasia (e.g., tumor emboli, vascular occlusion), disseminated intravascular coagulation (thrombosis), and exposure to endotoxin (vascular injury). Necrosis caused by an obstruction of the blood supply (infarct) generally has well-delineated borders microscopically as a distinguishing feature ( Figure 3 and Figure 4 ). In a rat study to evaluate the effects of feed restriction on common toxicologic parameters, severe diet restriction (75%reduction) of only two weeks resulted in bone marrow necrosis and degeneration. 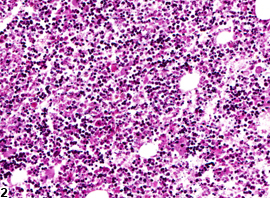 Specific observations included vacuolated or necrotic-appearing stromal cells, necrosis of hematopoietic cells, remaining hematopoietic tissue <25% of concurrent controls, focal areas of hemorrhage, and readily observed emperipolesis of neutrophils within the megakaryocytes. Necrosis should always be recorded and graded, and the distribution should be described in the pathology narrative. Regarding necrosis and inflammation, primary or secondary inflammatory processes must be distinguished: a primary process should be recorded separately, while a secondary process need only be recorded or described if warranted by its severity. 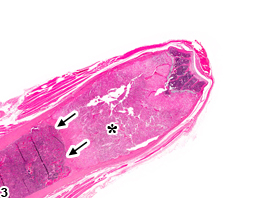 Gross morphologic descriptors, such as “coagulative” and “caseous,” should not be used for histologic description of necrotic lesions. When a thrombus is seen or is perceived to be the cause of the necrosis, it may be described and interpreted as ischemic necrosis/infarct in the narrative and the thrombus, if present, recorded separately. Levin S, Semler D, Ruben Z. 1993. Effects of two weeks of feed restriction on some common toxicologic parameters in Sprague-Dawley rats. Toxicol Pathol 21:1-14. MacKenzie WF, Eustis SL. 1990. Bone marrow. In: Pathology of the Fischer Rat: Reference and Atlas (Boorman GA, Eustis SL, Elwell MR, Montgomery CA, Mackenzie WF, eds). Academic Press, San Diego, 315-337. Rebar AH. 1993. General responses of the bone marrow to injury. Toxicol Pathol 21:118-129. Weiss DJ. 2010. Myelonecrosis and acute inflammation. In: Schalm’s Veterinary Hematology, 5th ed (Weiss DJ, Wardrop KJ, eds). Wiley-Blackwell, Ames, IA, 106-111.